Embrilliance embroidery software for Mac and PC. » 1.133 – still more! When we first released the ability to remove stitches hidden under an applique a few versions ago, it sparked some interest and a bunch of conversation. 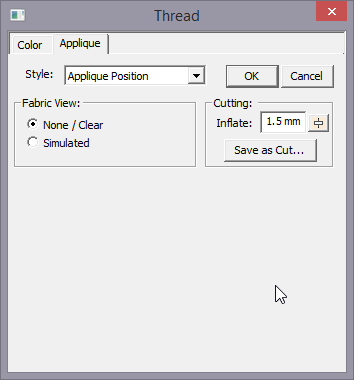 We then released in 1.132 the ability to save a cut file, and preview simulated fabric in applique designs, and that has been like a lightning strike. What if we were to tell you this was all building to something? Hmmm…Many of you have asked if we could make the lettering designs that are imported as BX files work with the new applique features, and yes we’re working on it. In this release, we are introducing the fabric simulation working on applique lettering designs! Sometimes digitizers make the Position and Material lines identical in size. This is because hand-cut applique really doesn’t need much allowance, and it can be a pain to digitize. But with the cut-files, you need a way to overcome the problem of having your Material not catch the applique. It is the same size, so how could it? Therefore we have added an ‘Inflate’ feature that lets you save the cut-file slightly inflated — not simply sized — but actually inflated geometrically so that your Material anchor stitches can have some fabric to grab onto. Ya know, there is still some space on that property page, and maybe we’ll just fill it eventually. Meanwhile, yes, there are still things to do, but we wanted to get this version to you, since your reception to our applique technology is so welcoming. It makes us want to keep adding more! P.S. we fixed a bug in Color Sort too on the Mac version this week. Sorry about that! Posted 4 years, 8 months ago at 4:51 pm.